1. Describe first, evaluate last. As noted above, students receive plenty of evaluative feedback–from gold stars and check marks to grades and comments applauding or correcting their work. To illustrate the difference, think about this analogy: if you went out to dinner and asked your friend how her soup was, and she said, “Excellent!” that would be evaluative. However, if she said, “The broth is really light and it has a hint of garlic, but it’s not overwhelming,” that would be descriptive. Now, if you were a student in a culinary arts class, and you received these two pieces of feedback, the first would let you know broadly that the instructor liked the soup, but the second would give you a lot more information about what you had done well. Stephen and Jan Chappuis have several excellent examples of descriptive feedback in this article on formative assessment. As the Chappuises note: “Effective descriptive feedback focuses on the intended learning, identifies specific strengths, points to areas needing improvement, [and] suggests a route of action students can take to close the gap between where they are now and where they need to be.” The message here is not that you shouldÂ neverÂ evaluate, but rather that the bulk of your feedback to students should be descriptive. For a deeper look at formative and summative assessment, this webinar has several great tips and resources. 2. Respond to students’ self-assessments. In John Bean’s book on integrating writing at the college level, Engaging Ideas, he offers the idea of having students write a cover letter about drafts of papers they submit, reflecting on the strengths in the piece of writing, areas for improvement, and specific questions for feedback. The teacher, then, begins his/her feedback to the student by responding to the cover letter–in essence, a conversation about the work is initiated by the student and continued by the teacher. This practice could be easily adapted to elementary and secondary classrooms, and is certainly appropriate for work other than writing. There are many ways to use self-assessment to examine what students think about their work–and by eliciting their perspective, we further develop their ability to identify their strengths, weaknesses, and take action to improve. This video from Teaching Channel uses the “Stop-Light Signal” for students to assess their progress and this document from North Carolina Public Schools provides several examples of using student self-assessment. 3. 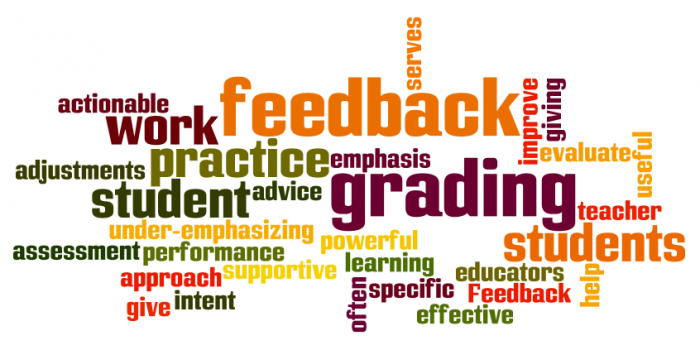 Help students learn the language of feedback. Determining some classroom norms for feedback is critical. I have seen classrooms with a sign showing an X through the words “I really liked it,” because that level of feedback is both evaluative and vague. The School Reform Initiative developed these feedback principles for professional learning groups–they are a good start to discuss with students. Using protocols, like a Tuning Protocol, to structure feedback can be helpful, as it includes steps for both positive and constructive feedback and prevents someone receiving feedback from jumping in every few minutes. When I started teaching, I thought the best way I could provide feedback to my students was by writing at least a full page of comments, thinking that it demonstrated my commitment to their work. For many students, it was not only overwhelming, but also very difficult to know what their next steps could be. By using a clear rubric, we can establish criteria for the work and comment specifically on those criteria. The rubric describes what quality work looks like, and our comments helps students identify areas of strength and challenge and a few specific actions they can take to improve. 5. Use technology for efficiency and quality of feedback. This video featuring master teacher Sarah Brown Wessling shares how she has used podcasting to give students verbal feedback, as opposed to writing out all of her comments. This practice is a great time-saver, but also improves the quality of feedback – think of all the times you’ve interpreted written feedback as harsh, when the person giving feedback didn’t intend that at all. With a voice recording, students can hear your tone and you can express your support in a genuine way.To be clear, if we save time, but the quality of feedback drops, you probably haven’t saved time at all, because student misconceptions or mistakes will persist. For example, if you just circle boxes on a rubric, with no comments to students, they will likely not be successful in interpreting your feedback successfully. What other strategies do you use to help students understand where they’re going, where they are, and how they can close the gap?